After an eternity on mute and with Raymond Watts seemingly in a creative wilderness, the PIG renaissance continues apace with the emergence of Risen less than two years after The Gospel and last year’s remix EP Swine & Punishment, as well as four digital / or tour-only releases off the back (bacon) of The Gospel. Risen finds Raymond Watts on fine form as he unleashes porcine pundemoneum once more. 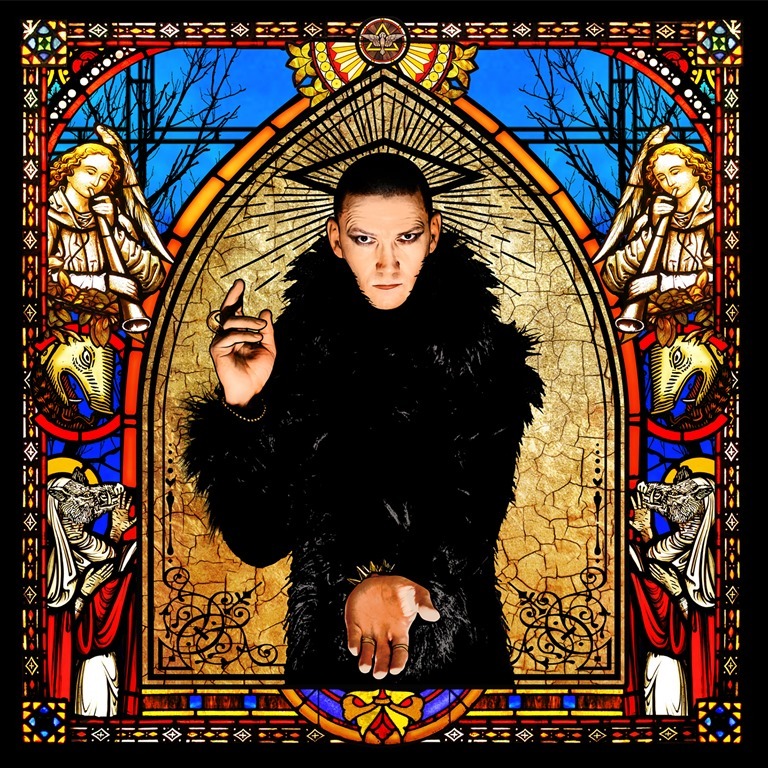 As the press release proudly proclaims, ‘the Lord Of The Lard calls on Ben Christo, Z.Marr, En Esch, Tim Skold, Marc Heal, Phil Barry, Mark Thwaite, Anita Sylph & Emre Ramazanoglu & gets to work on bringing glam to the damned’. It is a hell of a lineup, and pleasingly, Risen is a hell of an album. It’s actually a lot less overtly glam than The Gospel and finds PIG at their eclectic best. ‘The Chosen Few’ opens and hints at a return to the darker industrial grind of Sinsation and Wrecked. But while it’s a mid-tempo slow-burner, this being PIG, it’s not only got poke, but layers: hints of gospel lace the chorus, and it builds through a sinewy lead guitar break to a towering churn, with orchestral strikes and strings adding to the sense of drama. It’s impossible to declare anything to be truly ‘vintage; or ‘quintessential’ PIG: Watt’s project has always been built on hybridity and eclecticism. But against its predecessor or releases like, say, Pigmartyr, which were more direct, paired and back and rock-orientated, Risen draws together all of the divergent elements – from classical samples to battering technoindustrial antagonism – from the beginning of the band’s career onwards. Strings bolster up-front metallic guitars and thumping disco beats, and the sleaze is amped up to 11. As such, it’s all going on on Risen, and it’s something to see PIG rebuild the momentum and exposure they achieved in the mid-90s having benefited from association with Nine Inch Nails. It’s the electro aspect of Pig’s sonic arsenal that leads the swaggering groove of ‘Morphine Machine’, which echoes the ham-glam of The Gospel. The opening chords of ‘Loud, Lawless & Lost’ sound very like The Yardbirds’ ‘For Your Love’ before swerving into a lift of Bowie’s ‘Fame’. The nagging, clean guitar and funk is sort of perverse in its presence, but this is a PIG album, and anything goes. There’s always been a tongue-in-cheek element to Watts’ approach to both lyric-writing and composition, his infinite wordplay and musical intertextuality and hybridity representative of a postmodern playfulness, and it’s on display in full force here. Moreover, Watts dominates every bar with his JG Thirlwell-esque throat-based theatrics. ‘Truth is Sin’ plays the slow-burning anthem card to good effect, while allowing Watts space to spin infinite spins on clichés, and elsewhere, the solid chug of ‘The Vice Girls’ and ‘Leather Pig’ comes with instant hooks that are hard to resist. PIG have always been about the remixes, and quite (but not entirely) unusually, have been given to chucking remixes of previous prime cuts onto new albums: as far back as 1992’s A Stroll in the Pork, Watts &co have been slipping remixes and multiple versions, and five of the fourteen tracks on Risen are remixes, while ‘The Cult of Chaos’ first appeared on the Prey & Obey EP. None of this makes their discography any more navigable, but and it’s often difficult to describe any ‘new’ album as being entirely ‘new’, but again makes Risen entirely representative of the PIG oeuvre. And this is perhaps the most welcome addition since their return. Praise the lard indeed. Being a Sister of Mercy is a long way from being a full-time job, an even Andrew Eldritch must have a lot of time on his hands these days. Ben Christo isn’t one to sit idle, though, fronting Night by Night between 2008 and 2015, before founding Diamond Black the following year, as well as working alongside Raymond Watts on Pig’s Prey &Obey. 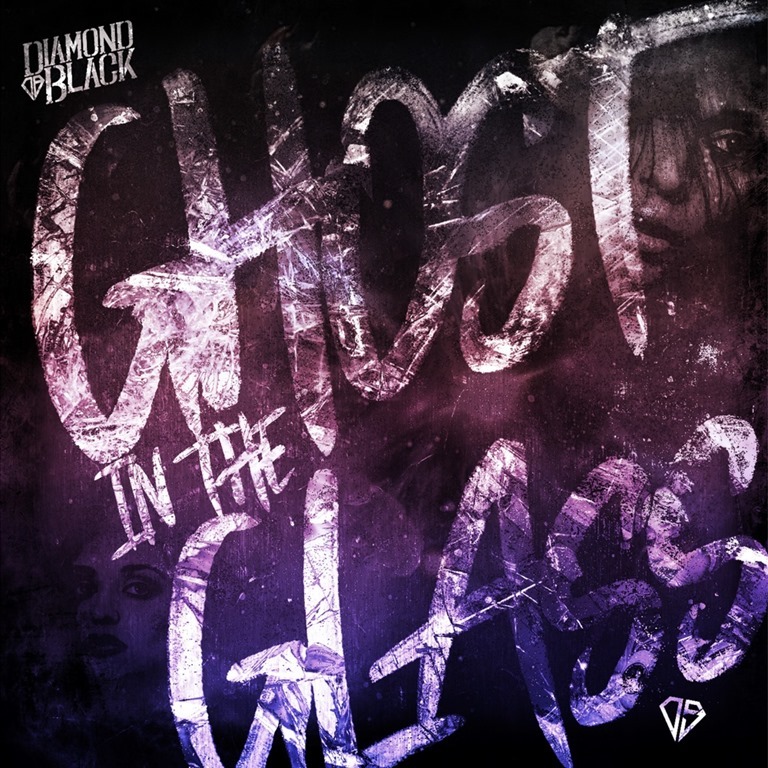 With their second single entitled ‘Ghost in the Glass’, it all hints at something that’s a bit, well, stereotypical goth, you might say – something The Sisters have always tended to avoid, despite being saddled with the somewhat ignominious tag of being the godfathers of the genre. But you’ll not find any bats or graveyards or introverted moping in the Sisters’ back catalogue, and thankfully, Diamond Black are more about the hard edges of polished steel than the soft feelings of doomed romanticism and despair. ‘Ghost in the Glass’ is built around a very contemporary Sisters-like guitar riff, a driving rhythm and spindly lead line creating a distinct dynamic tension. The guitars are up-front and pack some grit and heft, making this a more overtly ‘rock’ proposition, but the first point where Diamond Black clearly depart from The Sisters is in the live drumming, which, tight as it is, gives a freer feel. The second and perhaps most obvious point of departure is in the vocal style: singer J.I.Turunen is Finnish and brings a quintessential mainland Europe rock delivery: strong, but clean and melodic. Proper singing, if you will. If it carries echoes of classic 80s rock, it equally suggests that their biggest audience lies cross-channel, rather than domestically. This isn’t a criticism, not least of all because I must confess to having a soft spot for Andreas Bruhn’s solo album – and this, with its punchy rock attributes, is way better. The production’s expansive, but doesn’t detract from the forward thrust of the guitars and the result is a song that’s simultaneously widescreen and punchy. The bottom line is that Christo has a knack for a chunky riff and a decent tune, and it’s great to hear some of them being recorded and released. More, please! Since their initial (slight) return with the EP produced in collaboration with Cubanate’s Marc Heal on his guise as MC Lord of the Flies in the spring of 2015, PIG have been on a real (sausage) roll. 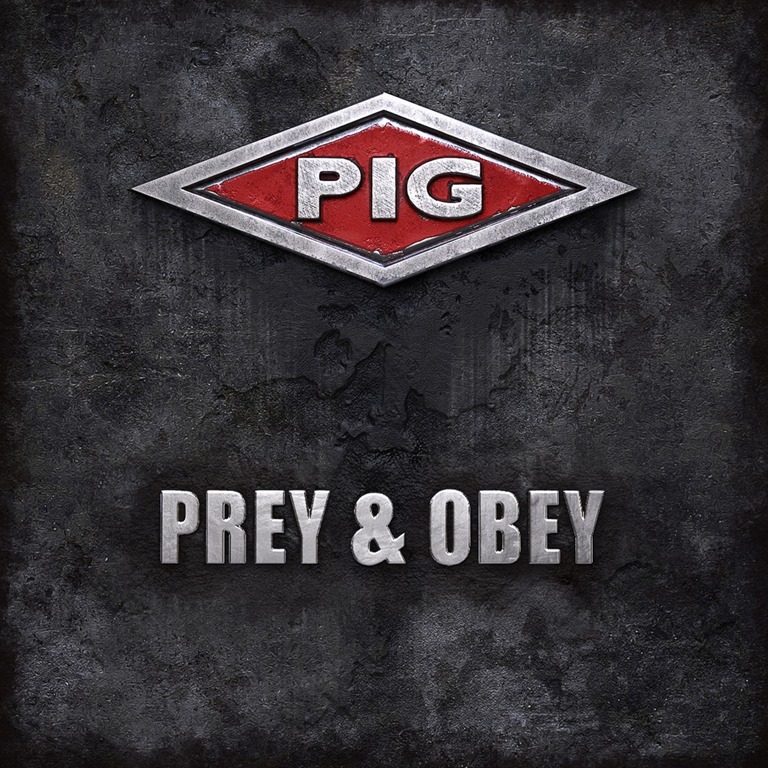 Hot on the heels of the remix album Swine and Punishment lands the Prey & Obey EP, which features three new tracks spawned from the same swirling cesspit of sleaze which gave birth to The Gospel, the first PIG album in a decade. Bringing extra meat to the lineup for this outing is Sisters of Mercy guitarist Ben Christo, who also receives co-writing credit for ‘The Revelation’. Meanwhile, the eternal PIG / KMFDM overlap is maintained courtesy of the En Esch, who contributes a remix version of the lead (prime) cut. ‘Prey & Obey’ positively explodes with heavy-duty guitar-led grunt and chug. It’s vintage PIG, drawing all of the elements that define the band’s sound from the span of their career: Watts spits and snarls over overdriven guitars melded to a thumping industrial disco beat while a swirl of strings whip up the layers of drama. It’s all delivered with a knowing bombast and, and as such, sits up there with anything in the substantial PIG oeuvre. Of the remixes, the Leæther Strip remix of ‘Prey & Obey’ fits the predicable technoindustrial groove version requirement, while the aforementioned En Esch reworking is darker, murkier, grimier, and more atmospheric. Collectively, they make for a rounded representation of what PIG are about. There’s snout wrong with that, and Prey & Obey is not only a rip-snorting effort, but up there with the best PIG releases.